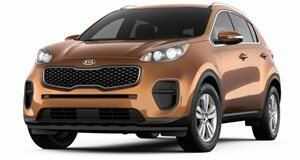 Last month at Detroit it was all about the new , but the automaker has not forgotten about the smaller and popular Sportage. Making its official debut here at the 2019 Chicago Auto is the which features updated exterior styling, a new trim level, and more convenience features. The refreshed exterior sports new headlights with optional LED turn indicators, redesigned projector-beam fog lights, and even available LED headlights and fog lights. Kia enhanced the current generation Sportage’s Euro-inspired design rather than changing it completely, and we think this was the right move. Notice the new front grille, bumper, air intake, and skid plate along with new alloy wheel designs. Out back, there’s a restyled bumper and skid plate. Kia even went as far as to redesign smaller details like the exhaust tip and tail light trim. Paint colors apparently carry-over from the current model, with one exception: the addition of metallic Steel Grey. Engine offerings are the same as they are now: a standard 2.4-liter four-cylinder good for 181 hp and 175 lb-ft of torque or the optional 2.0-liter turbocharged four with 240 hp and 260 lb-ft. Both engines are paired to a six-speed automatic gearbox sending power to the front wheels. All-wheel-drive remains optional. Prospective buyers will be pleased to hear that Kia is making available several driver assist features for 2020, among them driver attention warning, lane keeping assist, smart cruise control with start/stop, forward collision assist with pedestrian detection, and high beam assist. Official pricing and an on-sale date will be announced in a few months.